The Chilean Army comes by its German influences and traditions honestly, from a decent-sized influx of German immigrants during the second half of the 19th century, most of whom settled in the southern part of the country, centered around Puerto Montt, where the weather is cooler and wetter, and where dairy farms and breweries now abound. In the 19th century, however, German immigration wasn’t a precondition of adopting German military traditions. Beginning with the Elector of Brandenberg, Frederick Wilhelm, in the 17th cetury, the Prussians worked hard to develop a serious military culture, mostly as a reaction to the disastrous events of the Thirty Years War, which left more than half of all German men dead. By the time of the Great Elector’s grandson, King Frederick Wilhelm I and his son Frederick the Great, they had succeeded, and Prussia, despite its small size, was a formidable military power; so formidable that most of the bigger countries of Europe avoided fighting Prussia like the plague, and fledgling nations invited their cast-off officers to help them learn to soldier properly. Fast forward to 1870, and the Franco-Prussian War, in which the Prussians (with Otto von Bismarck at the wheel) rounded up various northern German principalities and in less than ten months had captured Paris and laid the ground work for the unification of Germany. Two years after the War of the Pacific, in 1885, the Chileans decided that if they were going to hang onto the Atacama and keep the Argentines in their place, they better get some training in modern warfare, and so they invited a group of Prussian officers and sergeants led by Captain Emil Körner to do the job. By the time Körner retired as the Commanding General of the Chilean Armed Forces in 1910, the Chilean army was the best equipped and best led in Latin America, a position it maintains to the present day. Of course, the Chileans haven’t had much call to use their army since the end of the War of the Pacific. The Bolivians, who brought in their own German military experts in the early 20th century, would like to get back their desert seaport in Antofagasta, but seem to prefer diplomacy to war. (Which is good, given that their generals seem so unsteady on horseback.) And their simmering feuds with their other neighbors have mostly gone cold. The one altercation the Chilean military has “fought” since the War of the Pacific in 1883 was something known as the Beagle Conflict, a century-long series of mutual, angry fist-shakings with the Argentines over the eastern entrance to the Beagle Channel, in Tierra del Fuego. The most violent event occurred in 1958, when an Argentine destroyer shelled an unmanned Chilean lighthouse located on a desolate rock. In 1984, after the intervention of Pope John Paul II, and the defeat of the Argentines in the Falklands War, the matter was settled peacefully. Today, Argentina and Chile consider themselves allies, sort of, and so in that video at the top of the post, at the 5:10 mark, Argentine soldiers are riding armored cars in a Chilean military parade, albeit under the flag of the U.N. peacekeeping force. 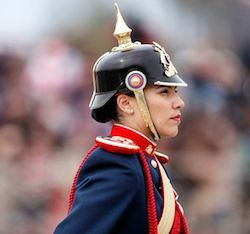 Finally, the Germanization of the Chilean army encouraged Chilean Germans to take up military careers, and even though only about 3% of present-day Chileans claim German ancestry, Germans are substantially overrepresented in the Chilean officers’ corp. Here’s a webpage showing Chile’s general staff. Note the teutonic family names: Heillig, Spielman, Heine, Meissner, Geissbuhler. By comparison, the high command of the Chilean Navy is more English and Scottish: Corthorn, Gary, Miller, McIntyre, Hardy. This also makes sense. In the 19th century, the Chilean Navy was advised and led by Englishmen, resulting in the best navy in Latin America. So, German army + English navy = the best military in Latin America. And goose-stepping parades and Wehrmacht Stahlhelme are peculiar relics of the building of a modern Chilean fighting force. Not a scene from Hogan’s Heroes. Speaking as a stout middle-age man myself, I sympathize with any stout middle-aged man forced to goose-step down a long stretch of hot asphalt. But, on the other hand, just looking at that picture makes me laugh out loud. IMHO this is a well Dj’d window into the formal history. Those stumbling on Youtube videos of the Chilean armed forces on parade and who become interested in the military history of South America, at least in this comparative kind that looks at the enduring practices in terms of styles and traditions, might start here. I like this synthesis. Thanks for those kind words. Most Americans don’t know enough 19th century history (or any history that’s not American) to process something like a Chilean army parade coherently. But, that’s correctable if one is interested enough. Nice page you have made and a very concise and fast way to introduce the Prussian Chilean Army to the public. There were two details that don’t belong in a nice page as the one you have created. 1-	The origins of the Guerra del Pacifico are very well know and detailed, stating the opposite just denigrates the good job you have made. 2-	“Bolivia still has a NAVY” This statement makes people think that Bolivia has a NAVY during the Guerra del Pacifico (Pacific War) and it didn’t. It was created in 1963 with four U.S donated boats for use in rivers and lakes. I would not call this a Navy or Armada unless it was part of a joke. I hope you take my constructive criticism as such, I really like your work, I just wanted to let you know there is space for improvement. 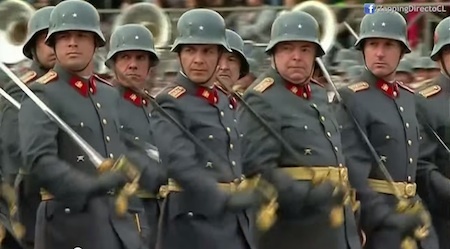 German influence or not, its still a very impressive military display – Chileans should be proud. I am currently writing a paper regarding the Prussian influence on the Chilean Army. I was wondering if you had the sources you used for this article, and if so, if you could share them. Many thanks.